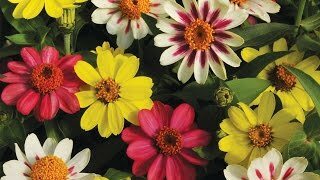 Semidouble 2-3" blooms in a vibrant color mix. Lacy foliage and silky flowers give an airy touch to the garden from midsummer to frost. Wonderful for cutting. Tolerates poor soil, heat and humidity. Easy to grow. Grows best in full sun. Attracts Butterflies. Proven tops for performance and adaptability. Space 12-15" apart. Start outdoors after danger of frost. Cosmos seed should be sown directly in the garden after frost. Direct sow seeds in average soil in full sun after danger of heavy frost. Select a location in full to part shade with good rich well-drained organic soil protected from wind. Seedlings will emerge in 7-10 days. Thin plants to stand 8-10 inches when seedlings are 1 inch high. Keep soil evenly moist but not wet. After plants are about 6 inches tall, a light fertilizer may be applied. Keep granular fertilizers away from the plant crown and foliage to avoid burn injury. Use low rates of a slow release fertilizer, as higher rates may encourage root rots. Tall cultivars may need staking to prevent their thick, hollow stems from breaking due to heavy rain or wind. Pinch off spent flowers to encourage continuous bloom. Pinching stem tips can reduce height and encourage branching but isn’t necessary. Deadheading is recommended since it lengthens the bloom season. Cosmos plants that aren’t deadheaded will self-sow in warm regions. Remove plants after they are killed by heavy frost in fall to avoid disease issues the following year. Cosmos plants can withstand heat and drought conditions. Tall cosmos add a soft, airy touch to the back of an annual or mixed border. You can also use them as a fast-growing annual hedge or in a cutting garden. Since the taller cultivars are not always uniform in height, they’re perfect for adding an informal look to cottage gardens. Shorter cultivars of both species are ideal near the front of the border, in containers, or as edgings. Cosmos makes beautiful cut flowers. Because cosmos is easy to grow and the seeds are large and easy to handle, it is a good choice for a children’s garden. Cosmos, Bright Lights Mixed Colors is rated 4.3 out of 5 by 24. Rated 5 out of 5 by scot from easy flower to grow, even you brown thumbs I bought thirty packets of these, plus cosmic orange cosmos at a local nursery last year and people don't seem to understand that you direct sow outdoors after a frost (not in seed starter trays) and the #1 reason they grow too large is you never fertilize this plant or compost and make the soil too rich or they will grow out of control(too much foliage and too tall and flower very little), they thrive in poor soil and love full sun. For a shorter more compact version try cosmic orange cosmos, it is an unbeatable performer and disease ,drought and pest free variety super floral abundant and reseeds itself all through the fall. Rated 3 out of 5 by MI 43 from Beautiful, but only orange I Purchased the seeds from Burpee and grew them a few years ago. They were so beautiful and colorful that my mom also bought some too. This year when I was going through the catalog, I spotted them again and decided to buy them. They are still a beautiful flower, but The only color that bloomed was orange. There are also a lot taller this time around. I will probably not by the seeds again because I really wanted a shorter more colorful variety. Rated 5 out of 5 by Smya from Cosmos are beautiful flowers As in Boston it is still cold outside, I sowed indoor last week. This is the first time I am planting this flowers. In just 5 days the seeds germinated and I can see the long, thin and delicate seedlings. Probably I will plant them outdoor in May. By the time here the temperatures will become warmer. Rated 5 out of 5 by 3catmom from Prolific! I've been growing these for three years now and not only are they dependable, they reseed like crazy! So be carefull where you plant them. Mine are now growing along our pasture fence and surprisingly, the cows couldn't care less about them. If you exhibit at the area fairs in flower shows, they are a good choice for that too. But if you want exhibit them for fall, plant some seeds later like June or early July (southeast) so you will have fresher, bushier flowers and foliage. Rated 4 out of 5 by AMA02910 from Be Careful Where You Plant These! I've been growing these cosmos every summer for over 10 years now. Last year I amended my soil to improve it. I must have improved it too much because these plants, that normally only grow about 24-36 inches, suddenly shot up to 8 feet tall. Not sure if was a breeding issue with the seed or if they just went gang-busters because they were planted in very fertile soil. Either way....I won't plant them again in those beds. By the end of the summer, they looked like were trying to out-compete my giant sunflowers. I should have taken a picture! Rated 5 out of 5 by Granma Becky from Beautiful mixed colors I planted these in our hot, humid July weather here in Alabama. They were slow to start. (I didn't water them much - just too hot to get out in the garden.) They survived, grew a little over 2 feet tall - then burst into amazing colors. Yellows, Reds, Oranges, Burgandy. The butterflies and bees flocked to them. I even saw a hummingbird drinking up their nectar one morning. Other reviewers didn't get a lot of different colors, but my plants had a beautiful variety of about 6 different hues. Rated 5 out of 5 by Justin and Sara from Lovely combination of colors We planted these one year and they have reseeded on their own for three years now :-) (The reseeding is easy to control. They're definitely not a "weed.") Very nice mix of excellent, bright colors. They also have a good height that's useful for planting in clusters at the back of our garden along the fence. They bloom wildly and will do it longer and better with dead-heading and some pruning. They definitely slow down by later summer, around early August in our hills, but continue blossoming enough until September. Despite the late summer slow down, still totally worth it. Their colors and their delicate flowers are wonderful.